The passageway into the small harbor looked wide and inviting, but the chart showed that only about one-third of its width was safe to use. And that one-third, I observed fearfully, any professional basketball player could walk across without holding his breath. But this was southwest Florida, where all the water is shallow, and there was no choice. Fearfully, I steered the 42-foot Grand Banks Europa along the curving route recommended by a cruising guide and into our intended anchorage in Pelican Bay, a highly regarded spot between Cayo Costa and Punta Blanca Islands. Polly, Jerry and Marijo peered into the water and saw the sandy bottom. Jerry later would joke he read the bar code on the oyster shells. The depth sounder was flashing single-digit numbers-6, 5, 4, 3.8. Subtract 2 feet, I remembered, for the offset factor, and hope the sounder is accurate at that depth. That meant that we had 2 feet, more or less, under the keel as Cheshire, our chartered yacht with a draft of 4 feet 2 inches, puttered along at dead slow. It was hard to believe. The view ahead was encouraging, however. There were yachts the size of ours at anchor. And several sailboats, too. If a sailor can do it, I thought, so can we. Still, it was unnerving. 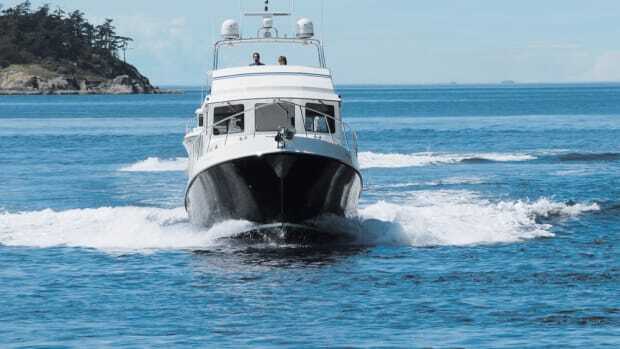 When we take Quadra, our 42-foot GB Europa, out of her home slip in Anacortes, Washington, we soon are cruising in water several hundred feet deep. Guemes Channel, our expressway to the San Juan Islands, does have some water as shallow as 30 feet close to shore, but down the middle it is deep and dark. I was not prepared for the scant water in Florida&apos;s Pelican Bay and began to suffer from physical conditions that seem to accompany dicey situations under way: a dry mouth, a tightening of the stomach, a touch of a headache-stuff I usually experience in huge seas or while navigating a busy channel in the fog. There is nothing more unpleasant and embarrassing than running a large yacht aground. While putting our boat in the mud would be bad enough, the idea of sticking someone else&apos;s boat was appalling. That would certainly produce a headache to remember. Somehow, we maneuvered Cheshire into the center of the harbor without touching bottom. We dropped anchor in about 9 feet of water, calculating we were safe even with a 2-foot tide overnight. The four of us have decades of boating experience, but none ever has anchored in such a skim of liquid. The bottom we could see seemed as flat as the land that surrounded us. At home, we might try motoring through 6 feet of water only to encounter a 4-foot rock. We just keep the heck out of shallow water. A gin and tonic relieved the headache and dry mouth, and we began to relax after completing our first run in Florida waters. Cheshire put her nose into a light southerly breeze that helped ease the unseasonable (unreasonable?) heat that continued to blanket the region. Complete relaxation was impossible; it always is the first night on an anchor. But I became increasingly aware that looming ahead were four more days of cruising shallow water aboard the chartered yacht, each filled with unlimited opportunities to wind up high and dry. Pass the aspirin, please. Vic showed me a chart of Pine Island Sound. With a long chain of low-lying barrier islands separating the sound from the Gulf of Mexico, it looked like a great place to cruise. Looking more closely, I noticed that it seemed shallow. Innocently, I asked: "These depths are in fathoms, right?" Vic grinned. No. The chart depths are in feet. It was clear that I would be able to wade across much of the sound, but closer examination of the chart revealed areas of really deep water- 9, 10, 14, 20 feet, for example. The Intracoastal Waterway runs the length of the sound, offering safe passage in 8 to 12 feet of water. One blink, one second of inattention, I thought, and you&apos;d be in the mud. Still, the Hansens continued, it&apos;s sunny, the weather is pleasantly warm in the winter and spring, anchorage is fine, the marinas are superb and there&apos;s plenty to see and do. And, they had several Grand Banks yachts available for charter. Also listening to this super sales pitch were Bill and Laurene Parlatore, editor and publisher, respectively, of PMM. Bill, who is my boss, thought there would be a good story in how deep-water cruisers from the Pacific Northwest coped in water not much deeper than morning dew on bright work. Really, I thought he wanted to make me squirm a little. We call ourselves Cheechakos-veterans of southeast Alaska. We have spent decades cruising wide, deep, cold waterways with plenty of elbowroom. We anchor in 30 to 60 feet of water and feel comfortable, even with an overnight tide swing of 10 or 12 feet. For exploring shallow water, we use the dinghy. There are rock pinnacles and reefs to hit along the Inside Passage, and if the collision is at cruising speed you may say goodbye to your boat. Cruising in 6 or 8 feet of water, though, seemed scarier. This campaign continued for a couple of days. The Hansens pitched the super weather and the nice boats available for charter. Bill dreamed about a great story. The pressure grew. We began to bend south. Remember, this was January in Seattle, and the idea of sunshine, warm water and tropical breezes became increasingly attractive. Finally, my wife, Polly, and I took the hook. We would go. Later, we signed up for five nights aboard Cheshire, a GB Europa built in 1983 and only four years younger than Quadra, the Europa we&apos;ve owned and cruised for a dozen years. We chose the last week in April and asked Jerry and Marijo Hudson, owners of a 32 GB based in Bremerton, Washington, and Alaska cruising veterans, to join us. The Hudsons drove to Florida and we flew. The morning we left Seattle the thermometer at Seattle-Tacoma International Airport read 32 degrees. When we disembarked from a Continental jet in North Fort Myers the temperature was 95. Our first night aboard Cheshire was in her slip at Burnt Store Marina, a resort development about 20 miles north of Fort Myers. Her twin air conditioners were purring when we arrived, and they kept the boat comfortable as we unpacked. Overnight, one unit was sufficient for sleeping. As with any bare-boat charter, we were responsible for provisioning, and we dared the heat while driving to a nearby mall for groceries. We decided to have dinner first and, acting on a recommendation from a store clerk, we found the Riviera Oyster Bar on Alligator Creek. In business for nearly 40 years, the restaurant adjoins a boatyard that mostly was occupied by cats that evening. Obviously, there are no &apos;gator in the creek. Or Florida cats are smart and quick. It was a good start. Grouper fillets and sautéed sea scallops won our praise. Wednesday morning we had our checkout drill with a skipper on the Hansens&apos; staff and then cast off. I looked back at Cheshire&apos;s slip, a Mediterranean-style mooring, and hoped I&apos;d be able to back in among the rows of pilings on our return. Outside the marina, the marked channel bisected a sandbar and led us into Charlotte Harbor. Our route would carry us west to the Gulf of Mexico, via Boca Grande Pass, or to our destination in Pelican Bay in Pine Island Sound. Depths in the harbor range from 8 to 16 feet, and because we could not see the bottom, the cruising was easy. The GB carries two generators, either of which can provide air conditioning. None of us, however, is accustomed to anchoring for long periods with a genset running-in the Northwest it&apos;s considered bad manners to leave a genset running after dark-so we chose to do without the a/c that first night at anchor. The boat faced a light breeze, and we opened all hatches in an effort to funnel fresh air aboard. And we all had a miserable, sweaty, restless, mostly sleepless night. During the night I thought about the southerly course we would take the next day and realized the worst of the uncertainties of shallow-water cruising were behind us. Once we escaped Pelican Bay we would be running in the wellmarked Intracoastal Waterway. We planned to stop at a couple of marina-resorts and, feverishly, I recalled that cruising guides and charts indicated that they were reached via channels marked by privately maintained day beacons. The heat, 30 to 40 degrees above temperatures we consider normal while cruising, would remain a major problem, however. It was so unseasonably hot that TV weather forecasters were moaning about it. When they could report that a few sprinkles of rain had fallen in a distant county, they almost danced with joy. There was nothing we could do but endure. Spirits perked up after we left Pelican Bay without incident and turned south into the ICW. A refreshing light breeze came over the bow and cooled us slightly. A bimini top shaded our seats on the flybridge. This was good cruising. We watched pelicans, birds we normally don&apos;t see, fishing in the shallows. A couple of dolphins rushed to greet us and leaped clear of the water in their joyous welcome. They reminded us of the Dall&apos;s porpoises we often see in Pacific Northwest waters. Black-and-white torpedoes, the porpoises love to zoom in circles around and beneath yachts and to swim just off the bow, just like their Florida cousins. Ospreys had built large, rugged nests on top of the beacons and appeared to be raising families. In a couple of places their nests obscured the signs and shadowed the solar collectors that charge the batteries that operate lights. Rather than toss out the ospreys, the Coast Guard, in at least one place, had moored a temporary marker next to one whose light had been rendered useless by the birds. On a chart, the ICW looks impossibly narrow, with a confusing array of numbered red triangles and green squares (all mounted on pilings) indicating the outer edges. The real thing is much different, much better. Often, I judged, the channel was 50 yards wide at least. It often was wider, and at times it seemed narrower. There never was any question about where to find "deep" water. There was no problem following the channel. And, since I had given up worrying about how deep the water was, we were having a good time. Most of the boats in the channel were sport fishermen or express cruisers. They were all fast and churned up wakes that were hard to avoid. But we rolled along, sometimes passing boats under sail. In the middle of Pine Island Sound is a little island named Cabbage Key. It is famous for attracting personalities because it was built by the family of Mary Roberts Rinehart, the mystery writer. She visited the island often and influenced its development, according to legend. The island&apos;s restaurant, it is said, inspired Jimmy Buffett to write his famous song, "Cheeseburger in Paradise." Walter Cronkite, some say, considers it a favorite place, as do other Hollywood and TV personalities. A 7-foot-deep channel just wide enough for two boats to pass branches off from the ICW and leads to the island&apos;s moorage. We decided to drop in and join the famous for lunch. Although our propellers were kicking up mud, I kept thoughts of water depth at bay while maneuvering our 42 GB against a row of pilings precisely enough to place the swim platform against the corner of a pier. The bow of another 42 GB jutted into our wiggle room, and a sandbar ready to surface limited our turning ability. In the Northwest, because of huge tidal ranges, we tie to floating docks. In Florida the tidal range is minimal (we saw a 2-foot range), and the piers are fixed. At Cabbage Key, and throughout the sound, pilings are painted white. In the Northwest, pilings either are covered with creosote or are concrete; the rubbing action of floats moving up and down with the tide would destroy a paint job in a few hours so pilings are not painted. That&apos;s too bad because the white paint adds a lot of class. From a distance the flat, low shoreline of Pine Island Sound is a dark blur of mangrove trees. On shore at Cabbage Key the tropical landscaping is vibrant with color and, we would discover, planted and maintained to provide maximum shade. In addition to moorage for boats to 100 feet in length, Cabbage Key offers overnight accommodations in rooms and cottages, and a restaurant and bar open to the public year-round. We found two old friends scrounging for tidbits along the walk to the restaurant: mallard ducks and crows. In the outdoor dining area was a bird new to us. A snowy egret strode regally between tables examining (qualifying?) patrons and perhaps looking for a fish out of water. The Cabbage Key restaurant is in the old Rinehart home. We sat at a table in a screened porch and had a fine shrimp salad, a Reuben sandwich, Coronas and lemonade for lunch. The cheeseburgers were huge and no doubt good, but not on a hot, hot day. The only people we knew, famous or not, were those seated at our table. Fighting off the urge to nap, we boarded Cheshire and fired up her twin diesels. And then we met Lady Chadwick. She&apos;s 62 feet long and 24 feet wide and seemed to overflow the channel as she came into Cabbage Key with a load of guests for lunch. Because she draws only 4 feet of water, Lady Chadwick advanced fearlessly. We hovered out of the way, our props kicking up clouds again, while the skipper expertly landed the small ferry. We would admire his skills again a few days later. The visit to Cabbage Key pumped our spirits even more, and we charged back into the ICW bound for a deluxe marina-resort on Captiva Island and a welcome dip in the Gulf of Mexico. We departed Pelican Bay at red marker 72 on the ICW. After lunch, we continued south in the channel, bound for red marker 38 and a right turn through shallow, shallow water to the &apos;Tween Waters Marina. Studying the chart and the marina&apos;s guide, I began to feel a twinge in the stomach, and it wasn&apos;t from shrimp salad. Running south in the ICW, we had Captiva Shoals to the left, or east. The chart showed depths ranging from half a foot to 3 or 4 feet through the shoaled area. Off in the distance we could see fishing shacks standing on pilings. We motored past Captiva Pass, the waterway between Cayo Costa and North Captiva Islands. A few miles farther south we passed Redfish Pass, which separates North Captiva and Captiva Islands. The passes looked tempting and the Gulf of Mexico beyond looked calm, but we had been warned that channels through the passes change with every storm and that good local knowledge was needed to transit them. We continued to be conservative and chose to stay in the sound, although we saw smaller boats zooming through from the gulf. At 38, Jerry turned right and settled on a compass course of 215 degrees, as directed by the &apos;Tween Waters Marina. We were looking for a red 2 marker on a tripod a mile distant, but the afternoon haze was so thick we couldn&apos;t see it. Jerry slowed and I used the binoculars. Finally, I saw a black scratch in the haze and told Jerry he was on course. We skimmed past the tripod and aimed down the center of a channel, following the red-right-returning rule. Water outside the channel was 1 to 3 feet deep, but the marina literature promised 5 feet in the channel at low tide. The depth sounder had been going berserk, indicating 80 to 90 feet of water beneath us when 5 to 7 was more likely. This apparently was because the transponder was so close to the bottom that it was confused by the return signal. The cloud of sand and mud we were stirring up probably degraded its effectiveness, too. So we didn&apos;t bother to check it as we headed toward shore. We were cruising on faith. Signs warned us to slow and to watch for manatees, and soon enough we began to see them. Later, Marijo would pat them on the head as the seagoing mammals swam lazily around our marina dock. It was a long run down Roosevelt Channel, and we could see several sailboats high and dry off to the side. We made a successful landing at the marina with the guidance of the sun-cooked, leather-skinned, coarse-voiced dockmaster and rushed to plug in 50-ampere power and to switch on the air conditioning. Simply securing lines left us dripping puddles of sweat, and the quickly cooling boat was the place to be. A snowy egret appropriated our swim platform as a fishing perch. He/she tolerated our presence and spent a busy evening nabbing tiny fish. An ibis, a much smaller but equally white bird, landed on a mooring line that drooped within inches of the water and proved equally competent as a fisher. Pelicans crashed into the water near the boat and bagged bigger fish. Often, they would spend minutes shaking and twisting their heads to get dinner lined up properly to be swallowed whole. Fishermen dressing their catch nearby tossed skin, guts and bones to waiting birds, and it all disappeared. After dinner, we discovered heaven on earth. The white-sand beach stretched as far as we could see north and south. Because we were on the west coast of Florida, the sun was slowly heading for the horizon across the sea, just as it does at home. This beach was so great that it helped us decide to spend a second night at &apos;Tween Waters Marina, with the a/c humming. We returned to the sand again before breakfast the following day and also tried the marina&apos;s large swimming pool and (this is perverse) its poolside hot tub. The second morning, Jerry and I settled into an umbrella beach chair to watch Polly and Marijo search for shells. Soon an attendant approached, hand out. Jerry found $6 for an hour of shade. For $20, it would have been ours all day. Captiva Island is connected by bridge with Sanibel Island to the south. Sanibel, in turn, has a bridge to the mainland. As a result, both are heavily developed with beach homes, condos, resorts and restaurants. It&apos;s all pricey. A local newspaper reported that the median price for a home on Captiva several lots away from the beach was $1.5 million. With its carefully groomed tropical vegetation and the smashing gulf sand beaches, it&apos;s also beautiful. We all were impressed. Each crew member contributed thoughts, good and otherwise, to a journal we carried aboard. Generally, comments focused on the excessive heat and the need to cruise within marked channels. "I dislike having to stay inside to be moderately comfortable," says one crew member. "It was still hot outside after dark, at 11:25 p.m."
Adds another: "My gosh, there&apos;s a lot of open, shallow water out there. 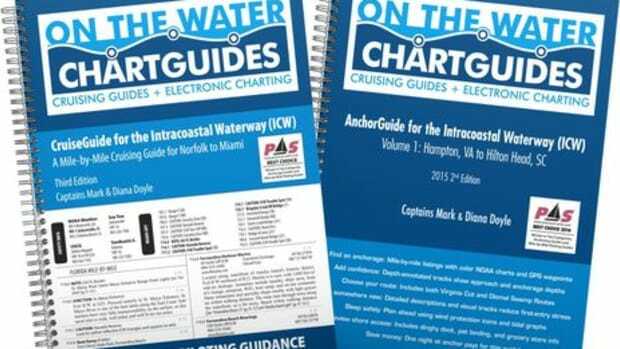 Everywhere you cruise you have to follow the ICW markers, which is, to me, very restrictive." Yet another comment: "This cruising lifestyle here in Florida is slower and more laid back." More weather reaction: "Thank goodness for the bimini, or we would all be fried!" Landscaping was praised, for the color and shade it provides. The architecture of resort buildings and private homes also was admired. "There is nothing quite like this en route to Alaska," wrote one sweaty crew member. 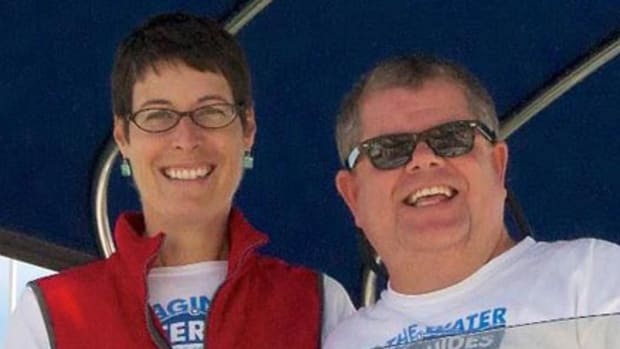 "It&apos;s too &apos;ta, ta&apos; and seems to attract people who are weekenders or fishermen, not serious boaters interested in serious treks aboard cruisers." And finally: "To me, it seems Florida cruising is not about boating but about the destination." At home, our global coordinates are North 48.31.114 degrees and West 122.37.38. At Cabbage Key, we checked the GPS and found our location was North 26.38.64 and West 88.11.34. As the osprey flies, the two points are 2,071 nautical miles apart on a course of 165 degrees. The most dramatic difference: Florida is so flat that you can see forever and see nothing unless there is a building in the way. It follows then that the sea bottom also is flat and the water shallow. Our part of the country is rugged, rocky and mountainous, thanks to uprisings in the earth&apos;s crust, volcanic activity and the big glaciers that plowed our waterways. Inside Passage cruisers usually wear jeans, sweatshirts, fleece jackets and vests or sweaters, and baseball caps. Gore-Tex rain gear is in the hanging locker, along with rubber boots for going ashore in the dinghy. In Florida, shorts and T-shirts, plus some kind of long-sleeved shirt for protection against the sun, were common. Surprisingly, when you consider the penetrating sun, not everyone wore a hat. We saw many local folk who were burned the color of beef jerky and whose skin had the same texture. I shed my socks but forgot my feet when I applied sunscreen. That was my only ouch of sunburn. In Florida, boaters dress up some for dinner in posh marina-resort restaurants, but not for places like Cabbage Key. North of Vancouver, British Columbia, on the Inside Passage, there isn&apos;t a restaurant where the same jeans, sweatshirts (and even scuffed brown rubber boots) are not proper attire. We ate less and ordered lighter foods in Florida cafes. Our menu aboard Cheshire featured salads, fruit and gallons of water and soda pop. On our last morning, Marijo cooked our biggest hot meal of the trip, a huge omelet that kept us going for hours. I lost five pounds in five days via sweat and lighter meals. In the Northwest, tide books and current charts are worn thin in a season. We need to know the stage of the tide and the direction of the tidal current to exit our marina safely. Every time we drop an anchor, we first check the tidal change overnight and do rapid calculations to affirm the water depth is OK and to determine how much rode is needed. Northern routes include narrow passages (such as Seymour Narrows near Campbell River, B.C.) in which the water can run at 15 knots during certain conditions. Slow trawlers wait for slack water and need current information to determine the moment when flow ceases briefly. The West Coast has two complete tides a day, while the East Coast has one. For an afternoon and overnight stay in an anchorage, we often need to check two lows and two highs. In the spring and early summer the tidal range can be large, with minus tides of as much as 3 feet or more. Water depth in our cruising waters may vary 10 to 15 feet overnight, making accurate depth information essential. Because anchorages are deep, we carry 300 feet of chain. We&apos;ve used every foot of it, too. Cheshire has about 150 feet of anchor chain. Pine Island Sound tides are less dramatic, but no less important in cruising shallow water. If a 2-foot tide puts 5 feet beneath the keel instead of 3, it&apos;s worth waiting for. Our extreme West Coast tides mean the Mediterranean- style moorage that is common in Pine Island Sound won&apos;t work in the Northwest. We need floating docks that connect to the shore via ramps, which can become impossibly steep on low tides. Med mooring probably is more efficient because the stern of a boat touches the dock, not its full length. Backing into a Mediterranean tie can be challenging if there&apos;s a breeze on the beam. Cheshire was equipped with a full package of electronic navigation gear: radar, autopilot, GPS and loran, depth sounders and VHF radios. Visibility was good, except for some afternoon haze on the horizon, and we didn&apos;t use much of the equipment. Courses were short and usually our destination clearly was in sight. We used the compass a couple of times. The depth sounder was always on, but we often were too intimidated to look at it, and it sometimes was crazy. We switched on the GPS to keep track of our speed. We kept the VHF tuned to channel 16. In our home waters we always cruise with the radar on, although it may be on standby. If we are going beyond our home neighborhood we plug in and switch on our laptop computer and its chart plotting system. Summer fog is common in the San Juan Islands, often appearing suddenly, and both radar and the chart plotter are invaluable in finding a safe route through it. Cheshire is a good boat and would do well in the Northwest. The Hansens made sure we never would forget the splendor of the west coast of Florida by arranging moorage on our final night at a private club on Useppa Island in Pine Island Sound. Eastern businessmen bought the island in the late 1890s as a base for tarpon fishing expeditions. Eventually, a hotel was built in the early 1900s for fishermen and other guests. Still in use, its walls are lined with photos of anglers of a century ago-all men, most of whom went fishing wearing suits, white shirts, ties and, in some cases, vests. I guess they thought it wrong to have too much fun while fishing. Old fans twirled overhead in the hotel lounge. Vegetation outside blocked the hot sun. Cool air blew from floor registers. I expected to see Humphrey Bogart and Ingrid Bergman dancing in the corner. There are several dozen private homes on the island. There are no cars, only a few golf carts. Stone paths lead to the hotel and between the homes. Vegetation carefully groomed over decades forms an umbrella over the walks and, with a gentle breeze, strolling over the island was tolerable. Each home was awash in tropical color. If one needs to escape the world, Useppa would be one of the best places to go. Our friend Lady Chadwick was at the club pier picking up passengers when we arrived. Although she has only a single engine, the skipper made departure look as easy as maneuvering a subcompact. Crew members cast off stern and breast lines. The bow line, with a little slack in it, hung over a piling. The skipper engaged gears and, cranking the wheel left, pivoted a heavy rub strake on the port bow against the piling. The mooring line kept her from moving forward, while the stern swung free of the pier. The bow line was released and Lady Chadwick backed clear. Avoiding the invisible boundaries marking shallow water, her skipper outside the lines in Pine Island Sound, one must take some risk of running aground. Damage is unlikely because of the sandy, muddy bottom, and usually it&apos;s easy to back free. To develop that almost carefree attitude, one needs more time than we had, and a boat that could stand a little scuffing on the bottom. We were on someone else&apos;s boat and had neither the time nor a boat we were willing to ground, so we were conservative and cruised within the lines. We felt almost carefree crossing Charlotte Harbor on our way home that Sunday morning. There were no channel markers. We could make a turn without worrying. The buildings of Burnt Store Marina guided us across the sound, and we crossed through the sandbar on a rising tide. After fueling and pumping the holding tank, I backed Cheshire into her slip. I had learned to do a Med tie. It was midday and the sun torched us as we hauled our stuff to the Hudsons&apos; car. The pizzaoven weather was unpredictable and hard on our crew of Inside Passage boaters. Floridians apologized for temperatures and worried about the drought that blanketed the state. Had we gone during the winter months, we surely would have enjoyed moderate temperatures and come home raving about Pine Island Sound. But our schedules didn&apos;t work that way. With the car&apos;s air conditioning roaring on high, we drove to an open-air restaurant on the harbor for a last meal together. All we really wanted was cold water. Later, Jerry and Marijo dropped us at the Fort Myers airport. It was 93 degrees. At about 2300 local time our plane landed in Seattle. It was 42.